Canadians Harry Wasylyk and Larry Hansen invented the disposable green polyethylene garbage bag. Their idea was bought by Union Carbide and in the late 60s they began to manufacture the first green garbage bags for home use under the name GLAD® Garbage bags. 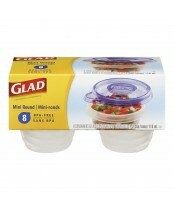 Today, Glad is an innovative company specializing in trash bags and plastic food storage containers.